To know how to identify the types of fire extinguishers and be able to properly use them. All fires are not the same. Know which fire extinguisher units to use for each type of fire. Point out the placement of all units. Have units available for the training session. Discuss how to read the label, select the proper unit, and how to operate, inspect and maintain it. Let employees practice using an extinguisher. Fire extinguishers can put out or control a fire until help arrives. Use portable units as first-aid or emergency units on small fires or in the initial stages of the fire. The discharge time on most portable units is only seconds, so plan an escape route. Stay low and avoid breathing the smoke and extinguishing agent. If the fire starts to spread, GET OUT! The universal classification system has four designations for fire extinguishers, class A, B, C, D. Based on the size of a fire to be extinguished and the contained extinguishing agent. A 20B rating is recommended for non-expert user. Combination extinguishers are suitable for more than one class of fire and are marked as such. The following chart will help classify fires that may occur on the farm. The label states the amount of dry or wet chemical contained in the extinguisher. Higher classifications equal greater extinguishing capacity. For example, an extinguisher classified as 4A can extinguish twice as much of a class A fire as an extinguisher classified as 2A. Look for the classification or rating to determine the extinguisher's capacity. Read the operating instructions on the label. Make location of extinguisher known. Remove from the mounting bracket by grasping the unit by the carrying handle and the base and carry it to the fire. Pull the locking pin to break the tamper seal. If the unit has a hose, remove the hose from its retaining clip. Move the extinguisher as close to the fire as possible. Grasp the hose in one hand and press or squeeze the handle or trigger release with the other. (If the unit is a CO2 extinguisher, grasping the plastic discharge horn may freeze the hand.) 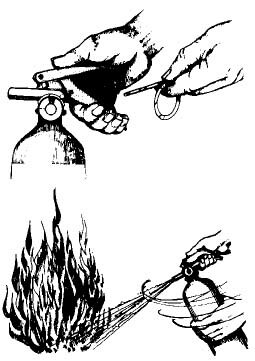 If the unit has no hose, direct the stream of extinguishing agent by moving the extinguisher. Use a side to side sweeping motion at the base of the flames starting from the near edge to the rear of the fire and then up the vertical surface. Always leave an escape route when fighting a fire. Inspect units monthly to ensure good working condition and adequate protection. Rotate the fire extinguisher to keep chemical form caking. Have units inspected annually by state certified individual. Are all extinguishers in their recommended location? Is there enough pressure to discharge the contents of the extinguisher (check the gauge)? Replace or recharge the unit as needed. Is the tamper seal in tact? Is the hose and nozzle unobstructed? Be prepared. Read the unit label before you need to use it for a fire. Inspect fire extinguishers monthly for proper functioning. Ensure that all designated locations have a fire extinguisher. 1. Fire extinguishers can be used to fight a major fire. 2. To put out a fire, aim at the fire and spray. 3. Focus on putting out vertical surface fires. 4. Any fire extinguisher will put out any fire. 5. Fire extinguisher should be inspected annually.